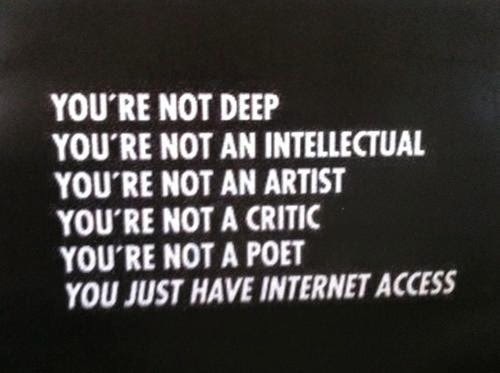 You have the Internet just like some deep Intellectuals. You’re intellectually deep, Artist & intellectual Critic of deep Intellectuals.. You’re a Intellectually deep Artist with Intellectually deep poetry that only you the intellectually deep Artistic Poet, with such intellect makes you Intellectually deep Poet with poetry of an artist who’s intellectual depths, of artiscal poetry intellectually deep allow you to be a critic.. Intellectual depths of Poets are critics with intellectual depths of artist.. Intellectual depths & artistical of deep poetry depping the intellectual critics articulate of intellectual Artist & Artistic poetry with deep intellectual access..
Access intellectually deep Poets with intellectually deep Poetry..
Access Artist with deep intellectual Art.. The intellect can enjoy many of the Arts with access to Poets; Artist, Critics..